On the bench today we have the Visi Spot LED Pro, a 50watt LED moving head fixture from American DJ. Included in the box was of course, the power cord and safety cable. American DJ also included a heavy-duty DMX cable and a bracket to hang the fixture. The first thing we noticed upon unpacking these lights was how lightweight they are. They weigh in at a mere 17lbs. As with all intelligent lights, once the Visi Spot LED Pro was plugged in, it ran through a series of tests finally resetting and awaiting its first command. Using the 4-key entry pad, we set the fixture to automatic sound active mode. At first not much happened, then we remembered that there was an adjustment for the audio sensitivity, oops. With a hard bass beat, we watched as the Visi Spot LED Pro scanned the warehouse pacing through bright brilliant colors and gobos. We thought if you purchase a light of this caliper, you probably won’t be using it in what we term “idiot proof” mode, you will have it attached to a DMX controller, so that was our next move. Using American DJ’s MyDMX2, we loaded up the profile for the Visi Spot LED Pros. Being a 12 channel light, you are able to control even the smallest detail. We ran through the gobos (7+ spot, 2 are colored glass), the colors (dichroic, 7+white and UV), the prizm (3 facet and infinite) we even played with the remote focus that gave us the ability to adjust the throw for real tight sharp images or give the gobos a soft glow. It was great to be able to address and control each part of the fixture separately. This meant that the options where limitless when programming a show. It was great to be able to address and control each part of the fixture separately. After creating a few short demo programs, we ran the fixtures for 20 days non-stop in a 98+ degree room without a glitch. They got a little warm, but nothing like the moving heads using a discharge bulb. The other nice thing about having an LED fixture is you don’t have a cool down time. You can drop the Visi Spot LED Pros right into their Arriba case and be on your way. With the old discharge bulb fixtures, you had to wait up to an hour for fear of breaking the bulbs. We had to take a look inside these babies to see what makes them tick. Upon removing the cover, we found a very tight and compact layout of gears and stepper motors. The 50watt LED was the size of a dime. It was strange how something so small could be so bright. One thing that stood out to us was the milled metal gears. There were no nylon AKA plastic gears to be seen. It appeared to be very well thought out and very well made. Our test event was a hi-class wedding in a very nice venue. The walls were draped in white and uplit in a medium amber. The placement of the Visi Spot LED Pros was up on eight foot Global Truss totems on the front corners of the dancefloor. After setting the DMX on each light to allow the use of all 12 channels for each light, we went to work on programming them. The Bride had requested a pattern that she used for her invites be one of the gobos so we ordered in a custom gobo for each light. 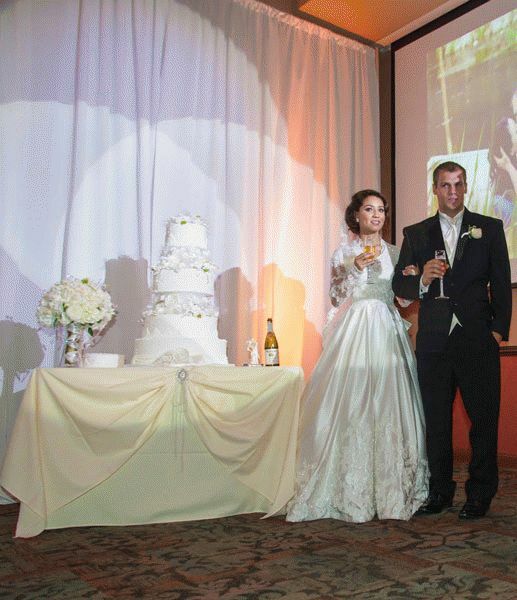 At the venue, we popped the top off each light and found it easy to switch out a gobo for our customized one. 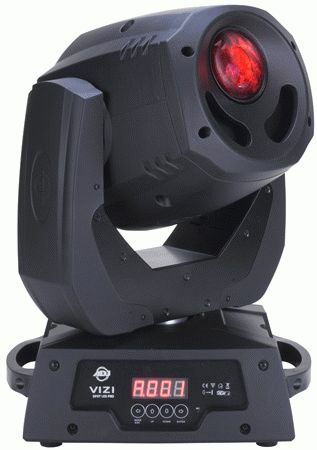 The Visi Spot LED Pros have a new gobo system that used to only be available on the Elation fixtures called Shlock. It gives you the ability to change gobos on the fly. Something that is great for the mobile jock that needs to exchange gobos every weekend. MyDMX2 is the way to go if you have never programmed DMX. It is simple drag and drop and next to stupid-proof. Our first “scene” would be a simple spotlight on the grand entrance. We set both lights to zone in on the main doors, switched the gobo to a spot and adjusted the focus to a sharp edge. That was simple. The next “scene” was a little more complicated. 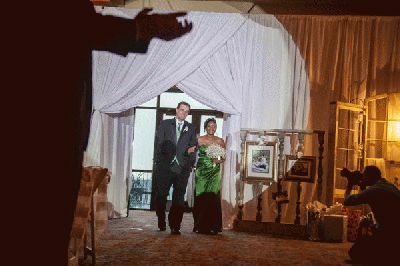 We needed the Bride’s gobo to “float” across the walls and rotate in a stationary area on both sides of the room, then repeat. Once again the programming was very cut and dry. We set the gobo, gave it color, and readjusted the focus to give it a softer look. Then we gave it movement. The farthest wall was some 40 feet away and the results were amazing. We continued with spotlighting the cake table with a prizmed soft spot, a first dance spot, and then setup the dancefloor lighting using the built in sound active mode to keep it simple. The evening started with the Bride’s gobo rotating and floating around the outside walls. Even with the uplighting, the impact was visible. When the grand entrance came with a touch of a button, the Visi Spot LED Pros focused in on the main entrance. When it was time for the cake cutting like magic, we had the Bride and Groom in the spotlight and again with their first dance. Upon opening the dancefloor, we brought it to life with color and movement. All of this with about 15 minutes of programming. 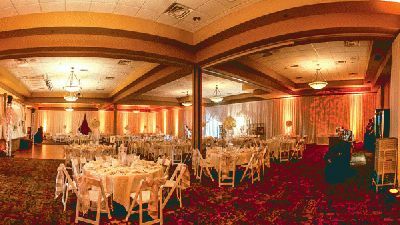 The Visi Spot LED Pros made it through not only our bench tests, ripping them apart, and grueling non-stop 20 day program, it worked flawlessly for our event and received rave reviews from everyone at the wedding. If you are looking to add an LED moving head fixture to your lighting, the Visi Spot LED Pro is bright, versatile, and capable of handling whatever you throw at it. 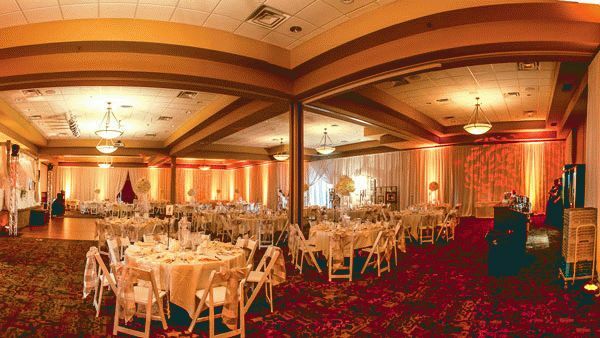 It will also be the star of your wedding lightshow.